We had a wonderful time in Marina's flat. It is modern, spacious and clean - and Marina was superb host. It's a stone's throw from the water - and just lovely to sit on the balcony to watch the commercial fisherman row their boats out for the day. The location is excellent, with lots of cafes and restaurants nearby - as well the beautifully restored old city. We also recommend going to the nearby fresh fish and vegetable market and cooking in-house with the fantastic local produce. Giovinazzo doesn't have the cache of some of the more famous tourist spots around, but it sure beats them on local character and ambiance. We loved this apartment - definitely one of the best we’ve ever stayed in. Spacious, comfortable and stylish, it has been furnished with the utmost care and lacks nothing in terms of high-quality amenities that any visitor could hope for. 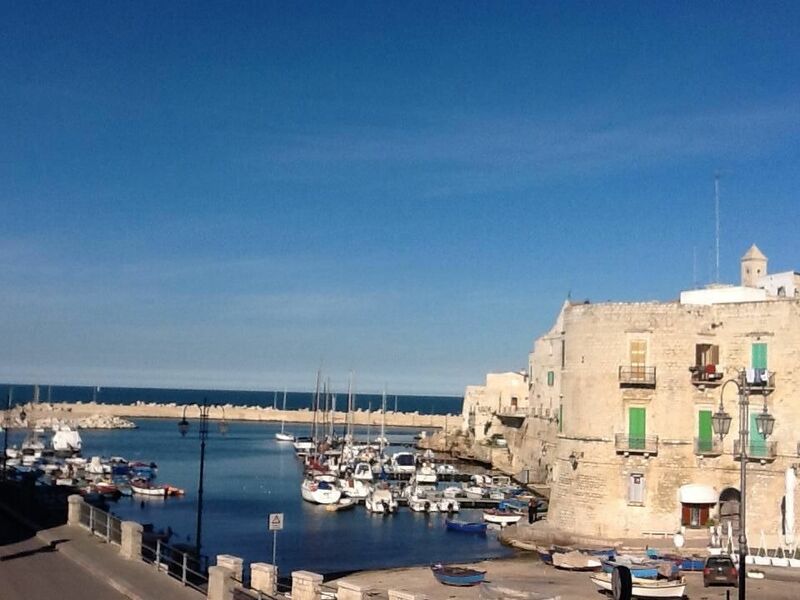 The living room balcony overlooks Giovinazzo’s tranquil little harbour which provides the most perfect view. The owners of the apartment, Marina and Lino, are a delightful couple and it was a pleasure to meet them. They were kind enough to pick us up at the railway station and even took us to the airport when we left. Giovinazzo is a picture-perfect small town with an unspoiled historic centre, pretty coastal walks, and an imposing central square that bursts into life in the evening. There are trains and buses up and down the coast and we made day trips to Trani and Polignano which are both beautiful towns. The local people we encountered were without exception helpful and welcoming. Thoroughly recommended- we’d definitely go back! My wife and I stayed in Marina & Lino's apartment for 7 nights, early September. We enjoyed a truly wonderful week. The apartment itself is absolutely delightful and the view from the sitting room balcony overlooking the little square and the harbour is absolutely stunning. The photos do not do it justice. We have nothing at all negative to say. The apartment itself is beautifully decorated and very well equipped, and Marina could not have been more welcoming, helpful or charming. Giovinazzo itself is also a very charming and friendly town, and the old town around the port, full of interest and perfect for the evening 'passeggiata'. We alternated between days "at home" in Giovinazzo and day trips away. There are several places of interest that are within an hour's drive, but still lots to go back for when we visit again. We thoroughly recommend - we had a great week. Many thanks Marina & Lino. Thank you so much !!! Alan and Mary for the beautiful review on homeway. I am grateful for the simple and beautiful words dedicated to my apartment and my city. We received a warm welcome from Marina, who was waiting for us at the apartment, which overlooks the small Piazza Porto and the picturesque port. The attractive old building in which the apartment is situated faces the large Piazza Vittorio Emanuele II surrounded by oleander trees, which really comes to life at night when crowds come out to enjoy the comparative cool of the evening. The apartment itself is very well equipped and has lots of information about the area and details of restaurants and other amenities. We shall long remember breakfast on the balcony and the breathtaking view of the small port with the ever changing colours. We cannot speak too highly of Marina and her husband Lino who were readily available to help but never intrusive. We really appreciated the home grown apricots and cherries together with home made jam and cheese which they kindly provided in such abundance.As keen gardeners we enjoyed being taken to the area where the various fruit trees grew together with tomatoes and courgettes. To sum up Giovinazzo is not a tourist area in the accepted sense, is relatively quiet and the old town has a charm of its own. It was lovely to see the local people and families coming out at weekends in large numbers to enjoy various locally organised events. Thank you Marina and Lino for a truly memorable two weeks. Marina and Lino gave a warm and informative welcome on our arrival even meeting us at the airport. The apartment with high vaulted ceilings and picturesque view of the pretty harbour really made for a perfect vacation. In easy walking distance to the old town and local amenities, would not hesitate on returning in the future. Caparra richiesta alla prenotazione tramite bonifico bancario. Contratto di affitto. Deposito cauzionale rimborsabile. (200 Euro) Consegna delle chiavi da parte del Proprietario. Nella tabella delle tariffe non sono incluse le spese di pulizia (50 Euro).